The favorite winter-past time of the locals ! A snowmobile excursion through snow-covered forests. The tour goes to some beautiful places with great views and the tranquility of the forest. Experience the wilderness and freedom of Swedish Lapland ! Along the narrow trails stops are made for tea and coffee and lunch and the guide will tell you about the surroundings. Activity type: Day tour / activity. Note the base price is for 2 people per snowmobile. You can also though pay an additional cost for one person per snowmobile. Duration: 2 hours. Tour starts at 10:00 am or 14:00 at Brandön Lodge. Please arrive about 20 minutes before the tour start time fit winter overalls, boots, gloves and had which are included. Booking in advance: Please book at least one day in advance. What’s included? Snowmobile suit, boots, socks, warm gloves, fleece, hood for underneath the helmet and a helmet are provided. Transfers: When booking you can arrange a transfer from and back to Luleå for a cost of 990 sek per adult and 495 sek per child. This transfer starts in Luleå at 9am or 1pm to leave plenty of time to meet the 10am or 2pm start of the tour. When booking the transfer you will be asked to provide your contact telephone number and the hotel or address in Luleå where you would like to be picked up. 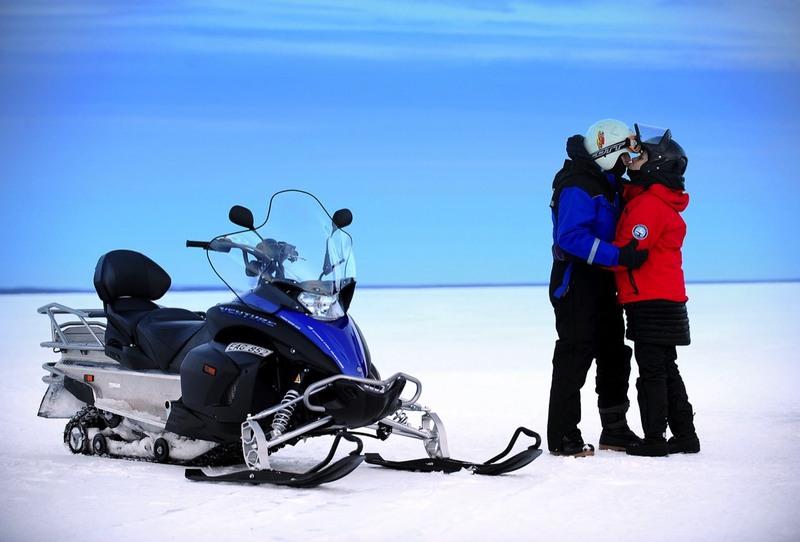 Join a fantastic nature and culture adventure to the Luleå Archipelago and explore the glistening fields of ice and snow and the forested islands on a snowmobile! Along the way our guide will tell you about the nature, wildlife and geology as well as our life in the northern wilderness. Our fellow explorers are offered lunch, hot beverages and a chance to try ice-fishing on the journey. One possible destination of the tour is the island Brändöskär in the outermost reaches of the Luleå archipelago. An idyllic fishing village dating from the 17th century with a timber chapel built in 1774. Brändöskär also boasts a large number of fishermen cottages which today are still owned by local residents and used more so now as as nature getaways. Outside the islands is the frozen Bothnian bay with its seemingly endless fields of pack ice and snow. Some years the blue ice of the sea piles up into formations about 10 metres high – a mighty experience! The lunch for the day is cooked over an open fire by your guide while we talk about the nature and culture of the islands. Snowmobile overalls, boots, socks, warm gloves, fleece suit, hood for underneath the helmet and helmet are provided for guests. Transfers: When booking you can arrange a transfer from and back to Luleå for a cost of 990 sek per adult and 495 sek per child. This transfer starts in Luleå at 9am to leave plenty of time to meet the 10am start of the tour. When booking the transfer you will be asked to provide your contact telephone number and the hotel or address in Luleå where you would like to be picked up. Activity type : Day tour / activity. Note the base price is for 2 people per snowmobile. You can also though pay an additional cost for one person per snowmobile. Duration : 4 hours including lunch. Tour starts at 10:00 am at Brandön Lodge. Please arrive about 20 minutes before the tour start time fit winter overalls, boots, gloves and had which are included. Snowmobiles are of course a fun way to travel but they are first and foremost a mode of transport that enable us to expore areas covered in snow and ice. In the winter it can be difficult to cross long distances with deep snow and snowmobiles are often the only way to quickly and comfortably access areas on our remote nature. A snowmobile, sometimes called a snow scooter, is a motorized vehicle designed for winter travel on snow. It is designed to be operated on snow and to a lesser dedgree ice and does not require a formal road or trail. Most are driven on open terrain or trails. Snowmobiling is a mode of transport that many people have taken on as a serious hobby. Early snowmobiles used rubber tracks, but modern snowmobiles' tracks are typically made of a Kevlar composite. Originally, snowmobiles were powered by two-stroke gasoline internal combustion engines and since the mid-2000s more environmentaly friendly four-stroke engines have dominated the market. Brändön Lodge is Luleå's premier snow mobiling location. Their guides are very experienced, safety focus and well as experts on the local nature and environment and fun. 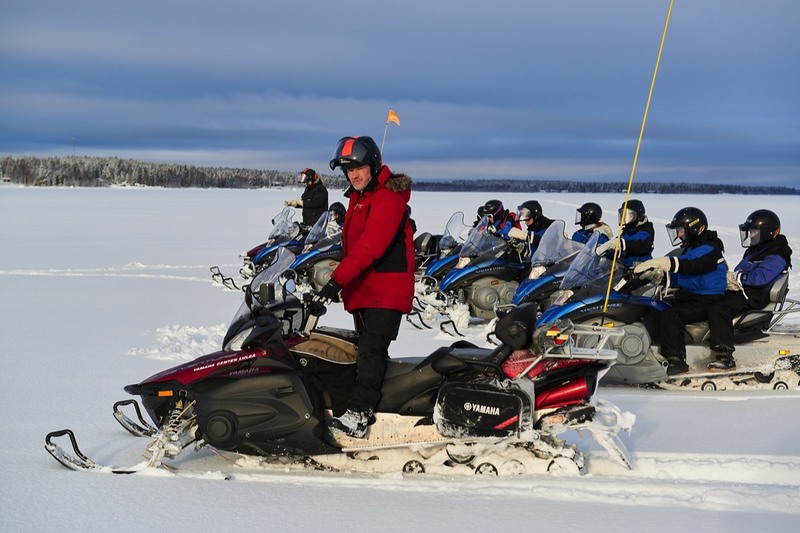 Snowmobiling is a high adventure activity and at Brändön Lodge you can be sure that the guides will give you clear and profesional informaton and teach you to drive the snowmobile in a safe and fun way.